Over the past three decades, scientists, healthcare providers, insurers and patients have played an important role in the discovery and development of next generation, innovative, disease-altering therapies. 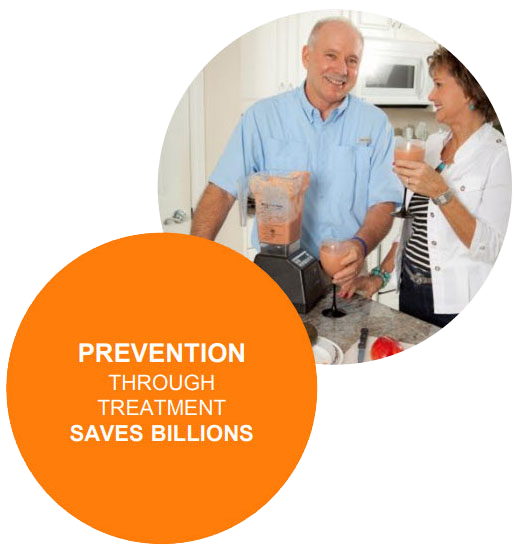 Breakthrough and specialty medications are leading the next revolution in healthcare services and healthcare savings in the long-term. The Congressional Budget Office (CBO) changed its scoring methodology to reflect savings in medical spending associated with policies that increased use of medicines in Medicare. A recent report by the CBO illustrated the beneficial impact access and adherence to prescription medicines is having on reducing other healthcare spending. Based on this methodology, the CBO now scores every 1% increase in the number of prescriptions filled with a 0.20% decrease in spending on other medical services, such as emergency department visits and hospitalizations. This non-partisan legislation scoring agency has credited effective use of medications with healthcare savings. 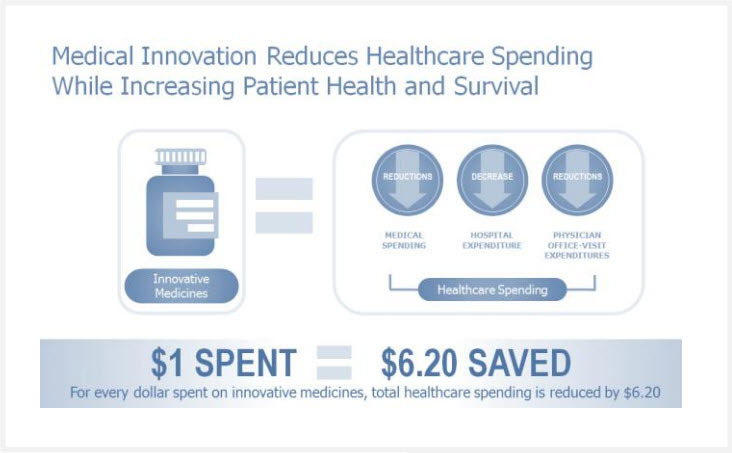 $1 more spent on treatments for heart disease = $3 to $10 in savings on emergency room visits and hospitalizations7,8. 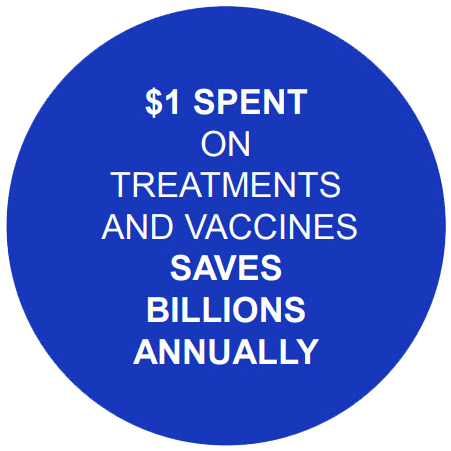 $1 more spent on diabetes treatments = $7.10 less spent on other medical services10,11. Just as insurance coverage has spread the risks and costs of expensive services such as hospitalizations, health benefits must evolve and not be a barrier to patients’ accessing more cost-effective and medically beneficial treatment options. 1 Congressional Budget Office. 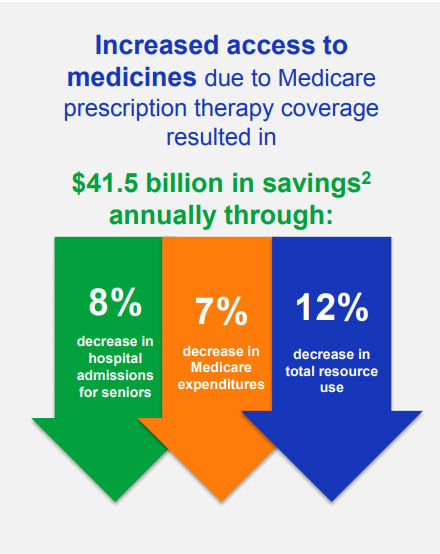 Offsetting Effects of Prescription Drug Use on Medicare’s Spending for Medical Services. November, 2012. Available at http://www.cbo.gov/sites/default/files/cbofiles/attachments/43741-MedicalOffsets-11-29-12.pdf. Accessed 11/19/15. http://www.nber.org/papers/w19948. NBER Working Paper 19948. February 2014. doi:10.3386/w19948. 3 DiMatteo MR, Giordani PJ, Lepper HS, Croghan TW. Patient adherence and medical treatment outcomes: a meta-analysis. Med Care. 2002;40(9):794-811. 4 McDermott MM, Schmitt B, Wallner E. Impact of medication nonadherence on coronary heart disease outcomes: a critical review. Arch Intern Med. 1997;157(17):1921-9. 5 Lau DT, Nau DP. Oral antihyperglycemic medication nonadherence and subsequent hospitalization risk and healthcare among individuals with type 2 diabetes. Diabetes Care. 2004;27(9):2149-53. 6 Sokol MC, McGuigan KA, Verbrugge RR, Epstein RS. Impact of medication adherence on hospitalization risk and healthcare cost. Med Care. 2005;43(6):521-30. 7 Grabowski DC, Lakdawalla DN, Goldman DP, et al. The large social value resulting from use of statins warrants steps to improve adherence and broaden treatment. Health Affairs. 2012;31(10):2276-85. doi:10.1377/hlthaff.2011.1120. 8 Roebuck MC, Liberman JN, Gemmill-Toyama M, et al. Medication Adherence Leads To Lower Health Care Use And Costs Despite Increased Drug Spending. Health Affairs. 2011;30(1):91-99. Available at http://content.healthaffairs.org/content/30/1/91.full. Accessed 11/19/15. 9 Shapiro AH. Federal Reserve Bank of San Francisco Working Paper Series. Does Medicare Part D Save Lives? Abe Dunn Bureau of Economic Analysis. Federal Reserve Bank of San Francisco. February, 2015. Available at http://www.frbsf.org/economic-research/files/wp2015-04.pdf. Accessed 11/19/15. 10 Adapted from M. Sokol et al. Impact of Medication Adherence on Hospitalization Risk and Healthcare Cost. J Med Care. 2005;43(6). Available at http://www.ncbi.nlm.nih.gov/pubmed/15908846. 11 Jha AK, Aubert RE, Yao J, et al. Greater adherence to diabetes drugs is linked to less hospital use and could save nearly $5 billion annually. Health Affairs. 2012;31(8):1836-46.
and Prevention. Available at http://www.cdc.gov/mmwr/preview/mmwrhtml/mm6316a4.htm. Accessed 11/19/15. 14 Lichtenberg F. Benefits and Costs of Newer Drugs: An Update. National Bureau of Economic Research, Working Paper No. 8996. June 2007. Available at http://www.nber.org/papers/w8996. Accessed August, 2015.